By Tim Royner: According to Roy Jones Jr., former eight division world champion Manny Pacquiao is just as powerful as he was before despite his advanced age of 40. Jones doesn’t see any drop off in the punching power from Pacquiao, and he says he’s not looking like an older fighter. Adrien Broner (33-3-1, 24 KOs) will be the judge of that tonight when he challenges Pacquiao (60-7-2, 39 KOs) for his WBA World welterweight title on SHOWTIME PPV at the MGM Grand in Las Vegas, Nevada. If Pacquiao looks like the same fighter he was last July against Lucas Matthysse, it’s going to end badly for Broner. Pacquiao was punching with a lot of power in that fight, and Matthysse never had a chance. Matthysse is known for having a good chin, but he couldn’t take the heavy shots Pacquiao was hitting him with. “He’s got to be AB and be motivated, which I know he is because he’s fighting the great Manny Pacquiao,” Roy Jones Jr. said to Fighthype. “He’s still focused on this fight. Now he’s back on the up and rise again,” Jones said about Pacquiao. “I think he’s just as powerful as before. Just as explosive as ever. The one thing you’ve got to know about Pacquiao is he’s got big calves. So his legs are still good. As long as his legs are still good…that’s the thing that goes on an old fighter. His legs are still powerful, so nothing has changed,” Jones said. Punching power is the last thing to go for a fighter. Pacquiao has lost speed, reflexes, mobility and energy, but he still can punch hard. If Manny can land his shots often enough tonight, he could drop Broner over and over again the way Marcos Maidana did. Even if Pacquiao doesn’t knock Broner out, he can dominate and embarrass him in the process of winning a one-sided 12 round decision. In that case, a decision will be just as good as knockout for Pacquiao. He’ll have the boxing public excited and ready to purchase his next fight on PPV, be it Floyd Mayweather Jr. or the winner of the Errol Spence Jr. vs. Mikey Garcia fight. Those are the two fights that Pacquiao is interested in right now. Mayweather would be the easier one. Spence is dangerous right now, and it could end badly for Pacquiao if he takes that one. It’s too bad this fight didn’t take place eight to ten years ago. Broner, 29, would have gotten a lot more credit if he were to beat Pacquiao back then compared to if he does it tonight. The boxing public will say that Pacquiao was an old man, and give Broner no credit whatsoever for beating him. After all, Pacquiao was beaten by Jeff Horn two years ago by a 12 round decision. That performance alone showed that Pacquiao is light years from the fighter that he once was. If this was Errol Spence Jr., Shawn Porter or Keith Thurman that Pacquiao was fighting tonight, he’d probably be in big trouble. But Broner is a fighter who lacks discipline, who seems to enjoy the night life outside of the ring, and who puts on a lot of weight in between fights. The 29-year-old Broner’s focus on boxing isn’t what it needs to be for him to take advantage of his youth to defeat the older 40-year-old Pacquiao. Pacquiao is back with his long time trainer Freddie Roach, and that is a positive for going into tonight’s fight. Roach has a way of dissecting Pacquiao’s opponents to give him the right instructions in between rounds. By now, Roach has come up with the perfect game plan for Pacquiao to follow to get the victory. If any adjustments are needed during the courage of the fight, Roach will come up with them. Whether Pacquiao follows the instructions from Roach during the fight is another matter. Pacquiao didn’t follow what Roach wanted him to do in his loss to Jeff Horn in 2017. Roach wanted Pacquiao to step up the pressure on Horn to get him out of there after he hurt him in round nine, but he didn’t do it. Pacquiao instead boxed Horn in rounds 10, 11 and 12, and it cost him the fight. It’s great that Pacquiao is back with Roach, but if he doesn’t pay attention to what is being told to him in between rounds, then he might as well be having Buboy Fernandez as his lead trainer tonight. “Me, Freddie and Buboy know each other well and we have a great coaching staff right now. 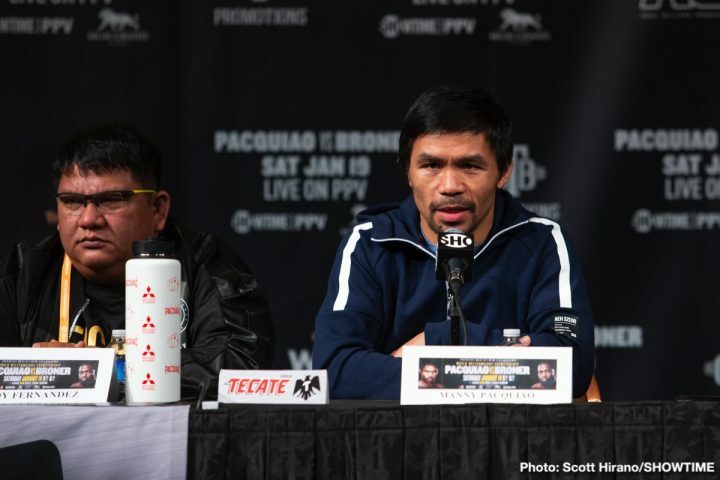 I’m happy with how everything has gone in training for this fight,” Pacquiao said to ESPN. Given how well Pacquiao performed in his last fight against Lucas Matthysse, it’s surprising that he bothered to go back to Roach. Buboy did an admirable job in the corner for the Matthysse fight. Of course, Matthysse was old at 36, fighting outside of his best weight class, and dealing with inactivity issues. This wasn’t a prime Matthysse that Pacquiao beat last July. This was the Matthysse that looked poor in defeating Tewa Kiram in his previous fight. Matthysse was getting out-boxed by Kiram for the first seven rounds before he finally let his hands go and stopped him in the eighth. Kiram had zero experience against quality opposition before facing Matthysse, and he looked like someone that didn’t belong inside the same ring with him or any world class fighter for that matter. Pacquiao’s win over Matthysse didn’t prove that he’s found the Fountain of Youth all of a sudden. It’s more of a case of Pacquiao being matched against a faded guy that was dealing with age, inactivity and fighting out of his natural weight class. The best chance Broner has of winning tonight is if Pacquiao is distracted by a looming big money rematch against Floyd Mayweather Jr. in September. The two of them teamed up for the ‘Fight of the Century’ in 2015 in a fight that made $600 million. The undercard was basically a skeleton crew of fighters. The majority of the purse money went to Pacquiao and Mayweather. The fight was sold for $100 per household on PPV, and it ended up seeing PPV records. If the two of them face each other again, there’s big money. If Pacquiao isn’t focused on Broner 100 percent tonight, he could lose. It’s a good idea for Pacquiao not to overlook Broner, who is treating this fight as his Super Bowl. Broner is going to be super motivated tonight, knowing that if he beats Pacquiao, he can get bigger paydays in a possible rematch, or a fight against the likes of Mayweather, Errol Spence Jr., Terence Crawford or Keith ‘One Time’ Thurman. It all begins with tonight’s fight against Pacquiao. If Broner can roll away the years of soft living, and lack of dedication, then he might be able to pull off an upset tonight against Pacquiao. Boxing » Adrien Broner » Pacquiao is just as powerful as before says Roy Jones Jr.
More boxing news on: Pacquiao vs. Broner ,Adrien Broner, Manny Pacquiao, Roy Jones Jr.